Last night we spent the evening with one of the funniest men on the planet. Although there was a host who supposedly was conducting the interview, I’d b surprised if he asked a dozen questions in the nearly hour and a half presentation. 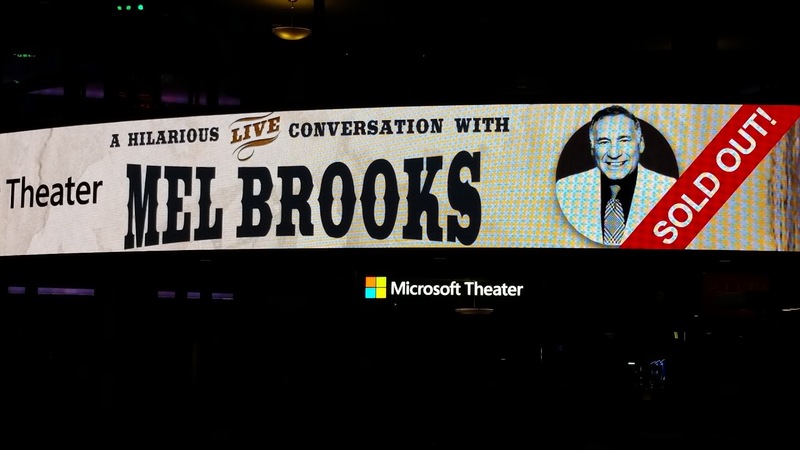 Brooks at age ninety, roamed the stage, rarely sat and frequently belted out songs from his films or in one case an American Standard that was the crux of a great joke. There were probably more than 4,000 people at the show last night. The Mircrosoft theater is the former Nokia Theater where we had gone two years ago for The Godfather Live. I think it changed sponsors just after we were last there. The room is spacious and the sound quality was excellent. Just after 8 pm, a title card came up on the screen which had been playing a series of trivia questions about Brooks and the film. The card announced that the Governor would be joining us in 93 minutes, harumph. We got a Digital screening of one of the classic comedies of all time. 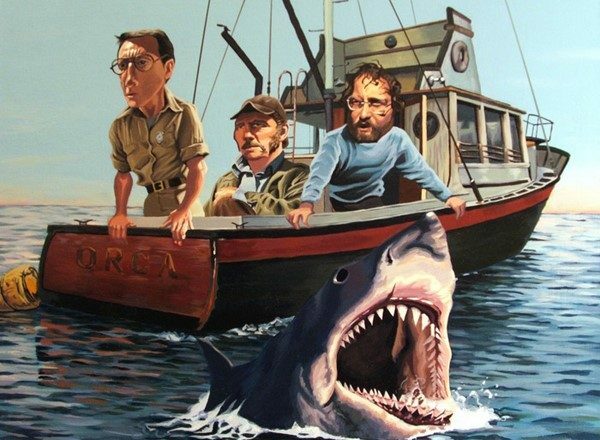 Complete with every politically incorrect joke that was in the film when it originally played in 1974. Just a few months back we had gone to a screening of Blazing Saddles along with Willy Wonka, in tribute to the late Gene Wilder. I don’t think there is much more to add about the film, so I will simply refer you to that post if you want to knoe my view of the movie. ( Blazing Saddles). When Mel came out after a joyously laughed at 93 minutes of lunacy, he received a deserving standing ovation which he quickly dismissed. He had fish to fry and he dove right in. The interviewer (I think it was Steve Halberman, but I could have that wrong) asked one question and fifteen hysterical minutes later we got to a follow-up question. Brooks makes the whole evening seem like an intimate experience with friends. Many of the stories he has told before, but they all sound fresh and unrehearsed and there are enough bits of improvised shtick to make you feel like this was all for the first time. One interesting moment was when a question was read by the host from an audience member, who turned out to be Dom Deluise’s nephew. Mel could not say enough nice things about Dom and of course he had a great story. 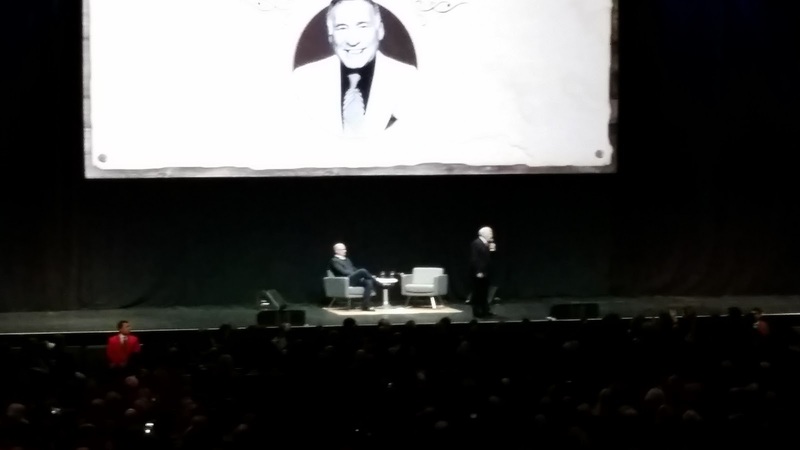 The whole evening was filled with anecdotes about Harvey Korman, Alfred Hitchcock, Richard Pryor, Carl Reiner, Sid Cesar, and a dozen more. 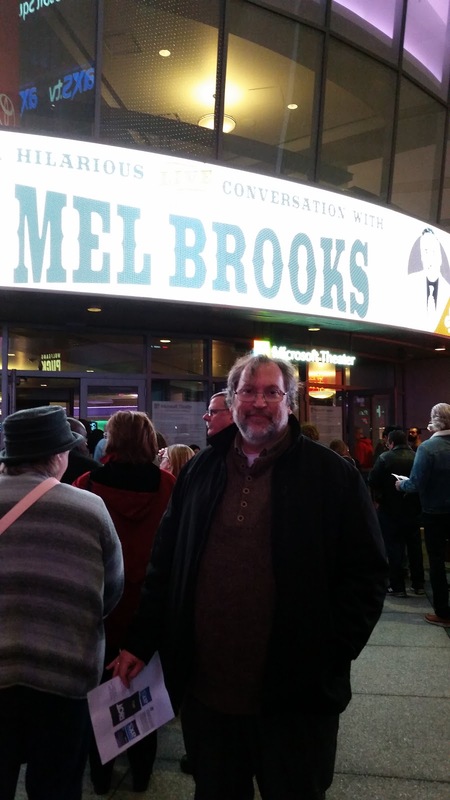 Mel told jokes, exaggerated a little and sang his heart out a couple of times without any accompaniment. It was a bravura performance by a man who is rightfully a National Treasure, and as sharp as a tack in his tenth decade of life. I’d be happy to go to a screening of “Young Frankenstein” and repeat the whole process over again tonight. This series of shows is billed as the Back in the Saddle Tour, if it comes to your town, be sure to splurge on some tickets and see the man live. Oh, this sounded this fun. It was great, I hope you get a chance to see him someday soon. So cool! A true legend. Definitely true. Appreciate the comment.